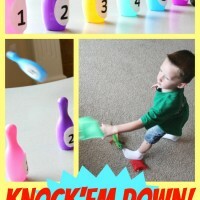 Turn a regular bean bag toss into an education carnival party game! I use this game to review letter sounds and recognition, numbers; you could even practice addition. Make into a carnival game by adding reward tickets for correct answers, or compete by keeping score. Let the games begin! 1. 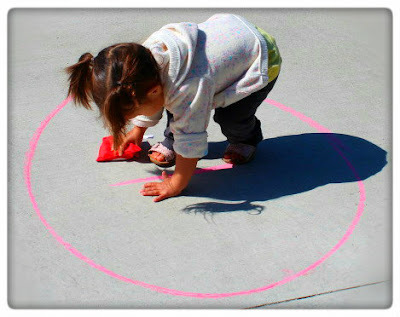 Draw circles for your kids with different point values in them. 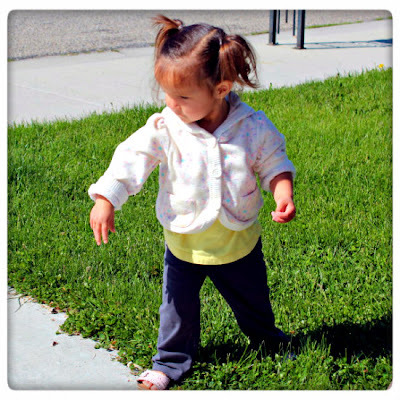 Use bigger circles for younger children and draw them closer to the throwing line. 2. 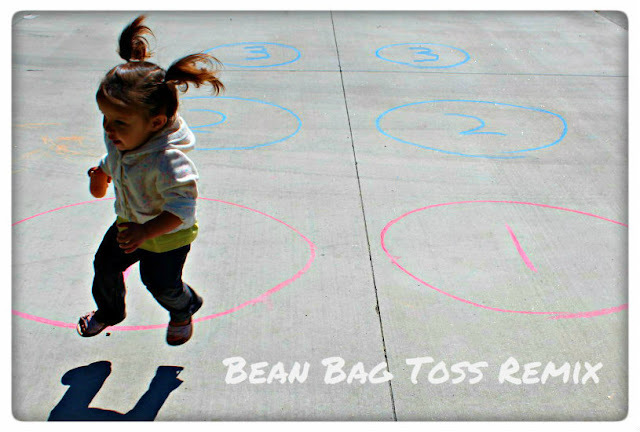 Then have your children throw bean bags into the circles to score points. 3. If they can sound out the letter on their bean bag, they get the points. You could also try sight words! 4. 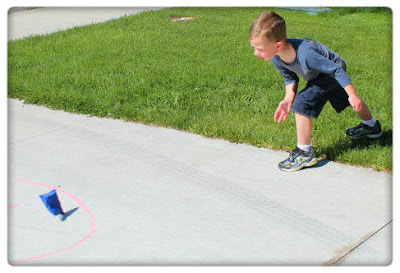 Keep score by writing their names in chalk and tallying the points. 5. Reward the winner. We use Popsicle Sticks! 1. Draw Letters, or whatever you want them to learn in the circles. 2. 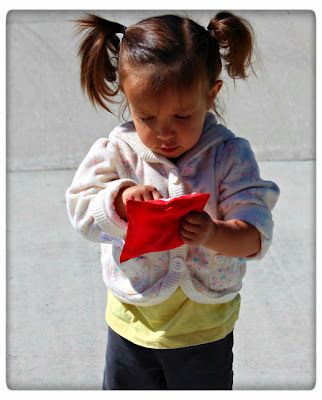 The children try to throw their bean bag on a letter. 3. 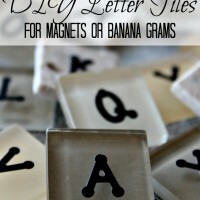 If your children say the sound of the letter they hit, they get a reward. 4. For indoor play, use hula hoops and letter mats, or simply have the children throw a bean bag in a bin. If they get it in the bin they can answer a question and win! To incorporate addition or subtraction problems, simply pick a number at the beginning of the game. This will be the first numeral in your equation. In the circles, draw +1; +2; or -1;-2 etc. When they get their bean bag in a circle, have them solve the equation starting with the number you picked at the beginning of the game. There are so many different ways you could play. 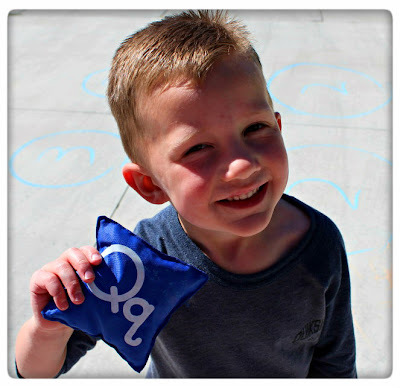 How do you learn with Bean Bags? I would love to hear about it in the comments below! Click here for more Educational Carnival Party Games! This is a lovely activity and the pics are so cute! I’ve shared it on Google+. Thanks for linking up on my Make My Saturday Sweet blog hop! What a great idea! I love games that are fun and entertaining! Hey! Found and followed you through MBC. I just love your blog! This looks like a lovely simple one that anyone could do at home or at the park. Do share with me over on my Country Kids linky too. Thanks for a great idea. 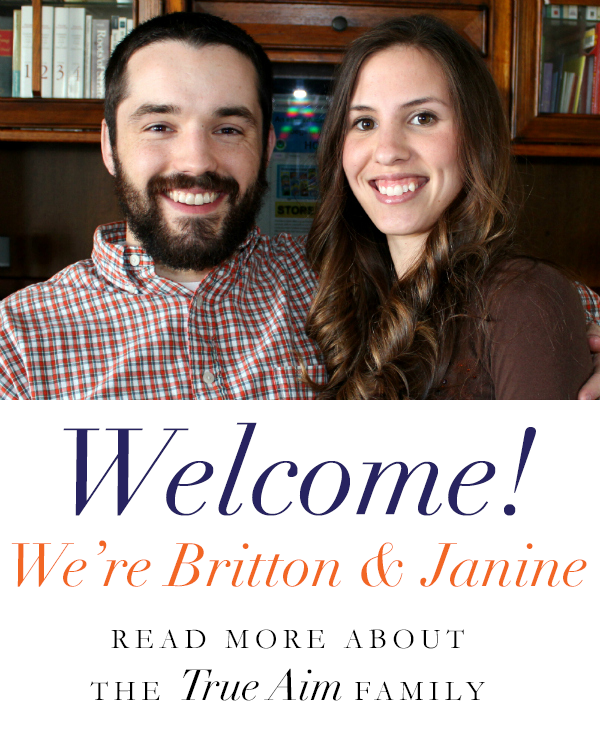 New GFC follower from blog hop. Can’t wait to hear from you! What a neat idea! We have a ton of sidewalk chalk and I know my daughter would love this. I’m all for games that combine learning with fun. Thanks so much for sharing! Great idea for improving coordination and throwing skills. Ps your captcha was really tricky this week. It took 5 goes to get it right, Thought you should know. Thanks for letting me know! I didn’t think I had it on. Great ideas! I’m in charge of the bean bag toss for our school’s Halloween party for 1st through 3rd. I’m looking for ways to change the bean bag toss to make it more fun for the kids. 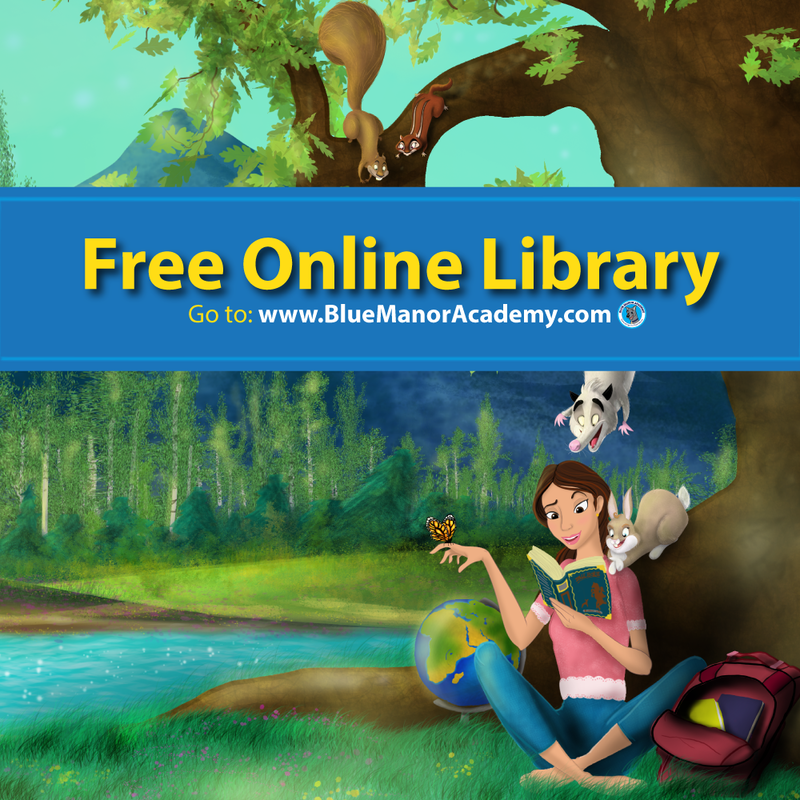 We’d love for you to link up to our Finished Friday Blog Party. So fun!! Thank you so much for sharing at Sharing Saturday! !